Marine Robotics :: Coda Octopus Products Ltd. Traditionally, ROVs rely on cameras for navigation and inspection because they are easy to interpret and offer first-person perspective. The limitations of this camera technology is that they require good visibility conditions. Therefore, when visibility is bad, ROVs do not fly. Our state-of-the-art technology, which forms part of our series of real-time 3D volumetric sonars, has changed this and now, irrespective of adverse conditions - including zero visibility conditions, ROVs can safely fly. We provide the world’s only first-person perspective volumetric imaging sonar for any water conditions. This technology, therefore, is a vital tool for safe navigation, obstacle avoidance, and critical asset inspection. It truly prevents downtime caused by zero visibility conditions for ROVs. 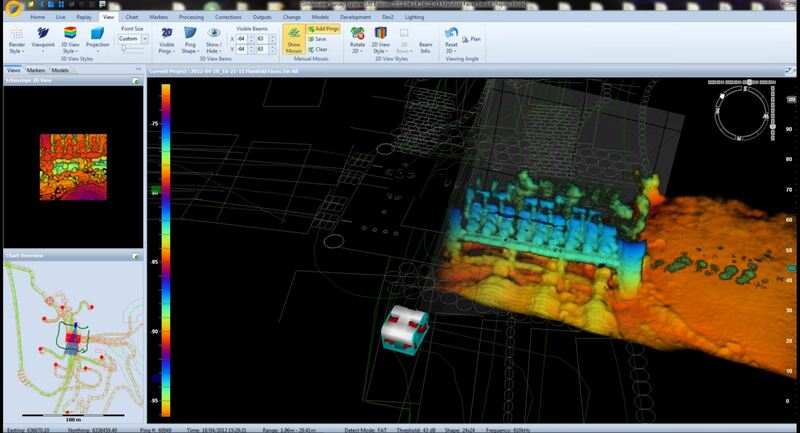 Our unique range of real-time 3D solutions of state-of-the-art technology with full 3D time series data is ideally suited to AUV applications and provides capability for adaptive route planning, full 3D time series data enabling look-ahead volumetric imaging and 3D obstacle avoidance. All these activities can be conducted simultaneously within this single real-time 3D sonar system.